Creative and smart, this kitchen concept makes use of an entire wall for designing cabinets with dark finish that blends well for all themes! This wonderfully designed kitchen concept uses both creativity and functionality in the right proportion. The dark finish of the doors of the cabinets is perfect for all kinds of interiors, and there is ample space to keep the kitchen essentials with special place for appliances. 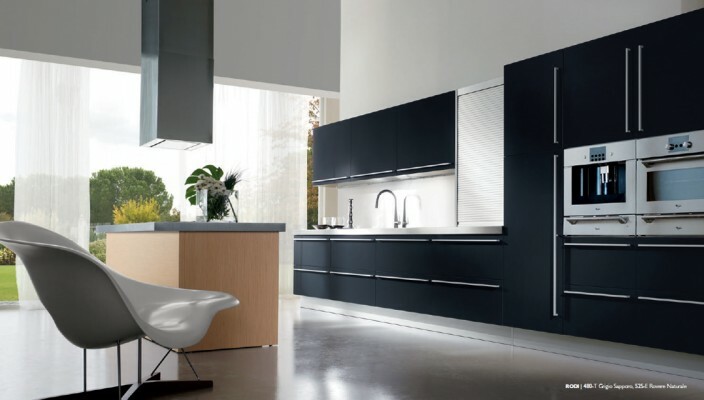 The design is simple and innovative elongated steel finish linings that add a sharp contrast to the dark doors. Also, the design uses the entire wall, something that will work for small and large spaces alike.